I have been self employed for 30 years writing manufacturing and accounting software. So at this time I am semi retried. I was looking for a hobby and think I have found it in Model Airplanes. I was visiting my good friend Motorhome Bob (Bob Maher) in his garage and he was showing me all of his airplanes. He told me he belonged to a model airplane club. I was interested in starting a new hobby so he invited me to the Modelers field one Saturday. We had a great time and so I started on my Journey. My first aircraft was not an airplane. I bought what I would call a “stupid” quad copter. I flew this in my backyard, in parks, and undeveloped land. I crashed this quad a lot!… but they’re tough and I think it will still fly. 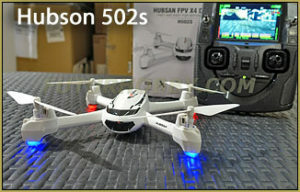 Then I purchased a more expensive Quad copter, a Hubson 502s. THIS was a real drone! It had all the bells and whistles including a 1080p camera and full GPS Lock. To this day I don’t think this aircraft has ever crashed!! … I enjoy flying it to get great video of our current airfield. The problem was: I had mastered this drone and needed some sort of challenge… Enter RC Airplanes. 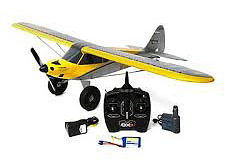 My first airplane was a 3 Chanel WL toys F959. 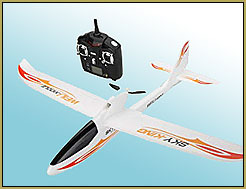 It’s a pusher plane, cheap at about $50 with transmitter. I proceeded to go out with my buddy, one day, and nose-dived it into the ground! I hate giving up… So I needed some help! In May of 2017, I went out to the Kingman Modelers field and got some flight training. I had purchased a Sensei, and the first thing we did, out there, was to disable the training features of that model. I guess no one understood that new technology. We flew that model in manual mode. I worked with them through late summer of that year when suddenly, the Modelers club kind of exploded, with people going different directions. The Golden Eagles RC Club had just started and I found Ben Poole, a young man who told me he would help me learn to fly. Great! We are back on track again. I worked with Ben for awhile but then his life became too busy and I was again on my own. So, one Saturday morning, I went out to the Golden Eagles field and tried flying my Sensei by myself… and crashed it into Montana Bob’s truck causing, I think, $1500 worth of damage: ouch! Then Jon Wilson (Golden Eagles president) stepped-up and said he would help me!! I was out a plane. Also very gun shy; my confidence was shot. I almost quit. But, I was taught a long time ago to never quit. So, Jon and I started on a quest to get me to learn to fly. Since I had crashed the Sensei, he allowed me to fly some of his nitro planes for a while, on Buddy Box. To tell you the truth, I felt those power plants were too powerful for a beginner. Don’t get me wrong, they are great… but maybe a bit complicated for a beginner. Also for a beginner, these airplanes are too expensive. I am sure just the motor was of equal value of the entire Cub or the Apprentice with transmitter… and THESE little planes come ready to fly! The buddy box worked great but I never learned to land those planes: too easy to crash and too costly to repair or replace. Enter Safe and Safe+ … Shawn, I think, started this when he purchased a plane called the Apprentice. This plane has a Gyro system in it like the Sensei. Only HE did not DISABLE it! BTW, Shawn was doing all this without a buddy box. I believe Jon gave the Apprentice a test-drive and liked what he saw. Next thing I know he purchases one for himself. We were flying this a few days a week and my flying was getting better. I was still a little gun shy. So I decided I was going to buy an Apprentice. But, before I did, Shawn showed me his NEW model, a Hobbyzone Carbon Cub with Safe+… and GPS… allowing for auto-takeoff and landing, a holding pattern while in-flight and a “virtual fence” that you can set up to keep your model away from the pits, and such. These are all new features and, to tell you the truth, I am just now grasping the concepts of this plane. So I purchase the plane from Shawn. I took the plane home and began to study the manual and went on YouTube to find out all I could about my new plane. There are some good videos on this model and other SAFE planes, as well. The set-up for the maiden flight did not go very well. Per the instructions, I needed to calibrate the GPS system. When I did this the plane would lock me out by locking control of the plane and setting the ailerons to bank. What I found was that I was trying do this on a metal table. When I got away from that table, it worked! So, don’t set up your plane on a metal table! I was past THAT problem, and ready to fly. Jon took the plane off with no problem… it was flying great!!! … when, all of a sudden, the plane hit the Virtual Fence and started flying back. We didn’t realize that that’s what had happened, and Jon felt that he was out of control and wanted to land it. I agreed and took control of the plane and hit the panic button. I was thinking the plane would land but it did not. I believe it went into “holding pattern mode”. The plane was pretty far away… so the plane was following its programming. Problem was, we were now not in control and we were trying to fight the plane’s advanced features. Well, we got it back, close-in and hit our flag pole!… and had a rough landing in the pits. There was no real damage so I took my little plane home to study what happened. After spending a week, studying the program, I found I could disable the GPS feature of the plane before takeoff! I called Jon and told him my plan and he agreed to help me give it another try. We chose a weekday so there were fewer fliers there… in case we ran into another out-of-control airplane! Success!! We disabled the GPS part of the plane and the little Carbon Cub flew like a bird!!! Then I began flying as much as I could. Take off and landing this plane is great and it’s pretty tough and forgiving. Both the Carbon Cub with Safe+ and the Apprentice are great planes to learn how to fly RC. The two planes seem to have plenty of power and do not seem to require the flight instructor to use a buddy box. Both planes have SAFE so they can use Beginner, Intermediate and Advanced modes. 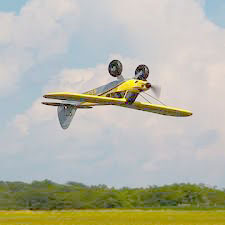 The planes will do loops, rolls and most aerobatics. The Cub uses a 1300mah 3 cell. I have used a bit bigger battery and a 2200mah works, as well. The Apprentice uses a 3300mah 3 cell. Flight times for both planes vary from 8 to 12 minutes… plenty of time to learn to fly. I suggest you get more than one battery. The Cub has a high wing and uses what is called a tail-dragger landing gear and the Apprentice is a tricycle landing gear. I have used both now and the tricycle I believe is a bit more easy to use. My conclusion in all this is that there is a place for this sort SAFE or SAFE+ planes to help you learn how to fly. I still think if you have an experienced pilot instructor there to help you, you will have better success. No matter what sort of electronics you have on your plane, you will crash… it’s just part of the game. So don’t stop with your first crash; learn from it and go on. So now we have I think five of these planes in the club… two Cubs and three Apprentice planes… and the people using these planes are having a great time learning to fly with their Golden Eagles flight instructors. I can’t wait to solo and start learning a new plane. I already have a P-40 48”. I am trying to install a gyro in it now… what can I say? I like tech. I have met some really fine people that are interested in this hobby and they all have one thing in common: they all love to fly and each is looking forward to building their next plane. 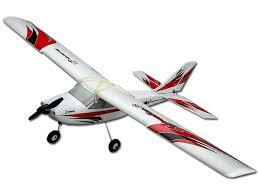 My advice if you’re interested in learning to fly RC: Get with a good club and instructor and have a great time. Put in the time it takes to Solo. So far, I have not met anyone I did not like and all, so far, are very helpful. You sometimes have to ask for help, and everyone seems ready to help. Hope to see you all at the field some time! We will have some coffee and we’ll have a great time enjoying flying together.